There are many great ways an author can save time in their day to day lives, but one of the best things they can do is use a scheduling tool like Buffer or Hootsuite to manage their social media. There are several options out there for scheduling tools and even more ways to utilize them. Deciding which to use can be difficult, but no matter which platform an author decides to use for their social media scheduling, it is guaranteed to be helpful for the author in many ways. Hootsuite is a scheduling tool that debuted in 2008. It allows authors to share updates on multiple social media channels at once, in addition to having many other features like team management, content curation, and analytics. The recent updates to Twitter has made sure that scheduling tools allow a user to post to one Twitter account at a time but that doesn’t mean an author cannot post to Twitter, Facebook, YouTube, Instagram, LinkedIn and now Pinterest all at once! One of the greatest features of Hootsuite is that it allows a user to see several streams of content from one social media account at once. This allows a user to see their Twitter feed, the tweets they have posted, been mentioned in and the tweets they have scheduled all at once! Pro Tip: The biggest benefit of Hootsuite, besides all I mentioned above, is that you can interact in real time, right from the dashboard. No need to log in and out of Twitter, for example, to respond to people — which is great! No other social media management tool that I know of (though there may one — I’m not sure) allows for this live interaction. While Hootsuite can be a great platform with phenomenal features, some users have found that Hootsuite can be confusing and difficult to use. This could mean that Buffer would be a better option for them. What is Buffer All About? Buffer is a scheduling tool very similar to Hootsuite but their dashboard is formatted differently. Buffer opened in 2010, and allows a user to do things like schedule content, analyze posts and track engagements, along with having a great image creator-Pablo by Buffer. Buffer is very similar to Hootsuite, with one of the biggest differences being price. Buffer costs just $10/month while Hootsuite is a little bit more expensive at $19/month. While Buffer is cheaper, it does lack some of the features that Hootsuite has. Buffer doesn’t allow users to see analytics for social media profiles, just posts. It also doesn’t allow users to interact and engage on their social profiles from Buffer; they can only post. SocialPilot* is an innovative tool that allows a user, not only to schedule original content but to sort through curated content and pick which articles to share on the social media accounts that are linked to the SocialPilot account. In addition, the very similar features of both Hootsuite and Buffer, SocialPilot allows a user to do bulk scheduling. It is as simple as uploading content, previewing it and selecting which account you’d like to post to. SocialPilot makes it really easy for a user to search for curated content by keyword and add it to the queue for specific accounts. #NaNoProMo Day 19: How to Decide on a Scheduling Tool and Why They're Helpful by guest @TheRuralVA and be sure to comment to win one free month of VA services with Emilie! Hootsuite is not only a great scheduling tool for authors, but it can also be a great time management tool. Scheduling can save an author time since they have content that will post automatically instead of having to log in to each social media account several times a day to keep posting and sharing content. Since authors can spend less time on social media, this gives them more time to write and take care of things like editing, and book marketing. A scheduling tool can be additionally helpful for an author when it comes to participating in memes like #MondayBlogs on Twitter. If an author has the availability to use a scheduling tool to make sure they can share a blog post each week, it can greatly help their visibility. In addition to time management and visibility, using a scheduling tool can help an author manage several social media networks at once, ensuring consistency across all platforms. This can be beneficial when it comes to managing keywords or branding since an author can find several articles that relate to their keywords or branding and share them on each of their social media platforms. Rachel really likes PromoRepublic because she can create easy graphics or use their ready-made visuals (100K to choose from), schedule easily to all channels (even Instagram), or find quick articles that are already optimized by keyword. They also have days of the week graphics, holiday-themed visuals, and lots of easy, fun visuals to customize in a few clicks. PromoRepublic helps you create amazing social media posts based on holidays, trends, events and more. Create professional marketing content in just a few clicks! You can click here* for a free trial. CoSchedule* offers SO many tools for writers, businesses, creatives — really anyone who wants to organize their online life. For as little as $20/month (14-day free trial), you have access to a plethora of tools, templates, calendars, and more. As Rachel has mentioned in her BadRedhead Media 30-Day Book Marketing Challenge and SEO book, she loves their free headline analyzer (she’d marry it if she could LOL). Which Scheduling Tool to Use? While both Hootsuite and Buffer are great options, as are the others mentioned here. Which scheduling tool you decide to use depends on both your budget and willingness to learn how to use a scheduling tool. Authors who want more in-depth functions and have more time to devote to learning how to use the tool can benefit from spending the extra money on Hootsuite or something else entirely — there are SO many options now. Someone who may not have as much extra money or time might like to go with Buffer since it is cheaper and offers a simpler approach to social media scheduling. Tell us your thoughts or what you use and recommend! Emilie is generously offering one FREE month of virtual assistance (a $140 value). You can enter to win by commenting below! Emilie Rabitoy is a retired dairy farmer who has found a way to use her work ethic to help authors achieve their dreams. She has been working full time as an author assistant since 2017 and loves her job, her favorite parts include social media scheduling and creating graphics. Emilie currently resides in Western Wisconsin with her fiance and two cats.She loves romance novels, geocaching, and coffee. Thanks for the comparison! I recently read some platforms are penalizing people who use 3rd party apps to schedule ahead by not showing their posts. Is there any truth to that? Hi Dylann — I just read a post on Buffer that shows an experiment they did with 200+ posts showing zero difference in organic vs third-party apps (Buffer, Hootsuite, and CoSchedule). I added the study to the post if you want to click on it. I also asked in two of my social media mastermind groups (top social media developer groups with anywhere from 3K to 25K members) and they said absolutely not. This is a rumor. Many of these people work for Facebook, Twitter, etc. Not sure how this rumor got started and many people believe it. I personally get incredible reach and engagement using a combo of various third-party apps posting to over 70 – 100 different accounts (depending on my client load) and have never seen this happen. That’s not to say I’m the ‘be all and end all’ definitive answer person — I’d be curious to see why people say this based on actual data. I guess we’ll see. Rachel and Emilie, thanks so much for this post! I’ve heard several of these scheduling tools mentioned in content writing chats, but people don’t tend to explain why they made the choices they did. Having some background really helps, and I appreciate your including it. I so need a VA but haven’t taken the plunge yet, hootsuite changed my life! A scheduling tool is definitely something I need to put into use. Thanks for the info here – it will definitely be helpful. I use and love Buffer. I’ve tried Hootsuite a few years ago but the interface felt clunky – I want to try it out again to see if it’s improved (well, see if I can relate to it better). I use SocialJukebox for recycling Twitter posts. I’m not sure how long that will be a viable option given the recent updates to the Twitter rules, but I only repeat posts every 6 months or so, so I’m hoping that won’t be a problem. It’s an excellent tool for recycling evergren posts. I recently bought a CrowdFire subscription from AppSumo, and want to test that as well … Buffer only allows 10 social media profiles on the basic paid plan, and I co-manage two group blogs which means I need more capacity. I love these social media scheduling apps! As some of these are not approved apps to use for scheduling I don’t use them. I use and love tailwind for both Pinterest and Instagram. Not only am I able to schedule without penalty I have access to tailwind tribes (free for anyone). I use revive old post for twitter to refresh my older pieces. Facebook has it’s own scedular. I use Canva for graphics. Overall I spend a lot less and feel it’s working pretty well. Do what works best for you is what it comes down to. Thanks for sharing! I have Hootsuite and I like it, but you’ve definitely shown me that I’m not taking full advantage of its capabilities! Looks like I’m going to have to spend a little more time fooling around with it! I’m a Hootsuite user. I tried Buffer, but something about Hootsuite’s interface clicked better with me. I love the streams, and the scheduling of course. I even like the new look of the publisher, now that I’ve gotten used to it. The mobile app is very easy to use – even better than the laptop version in some things. Every now and then it balks at posting images with posts. That’s the only beef I have with it. I’m happily using both Hootsuite and Buffer. Thanks for the tips on getting more out of them! 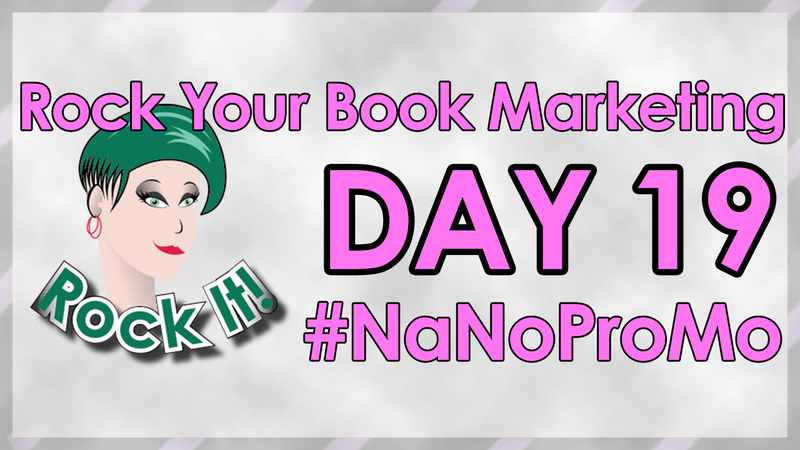 Previous Post Do You Have an Effective Book Marketing Strategy by @SmartAuthors Next Post Here Are The Winners For #NaNoProMo Week Three!